I love how this translates Thomas’s sense of wonder into a literal, physical experience. Kuijer does not tell us that Beethoven’s music makes them feel as if they were floating. Instead, they just float, borne upward in their chairs, drifting like low clouds. Beautiful. 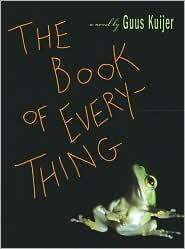 The Book of Everything won the Flemish Golden Owl Award, but is not widely known in this country. It’s really, really good. I highly recommend it. I suspect that, once you read it, you’ll recommend it, too.